Description This Greensboro, Georgia hotel has an outdoor pool, non-smoking guest rooms and a fitness Center. Comfortable rooms with free Wi-Fi are a good reason to book the Jameson Inn - Greensboro which also has a pool and offers free continental breakfast. There are 60 exterior-corridor rooms on two floors at this Greensboro hotel; all units have free Wi-Fi flat-panel cable TVs and microwaves and mini-fridges. The morning begins with a cup of coffee from your in-room coffeemaker followed by free waffles and other treats at the continental breakfast. In season take a dip in the outdoor pool. The front desk is open 24/7 and the fitness room has equipment for a satisfying workout. Vending machines are available to quell any snack attack and parking is free. 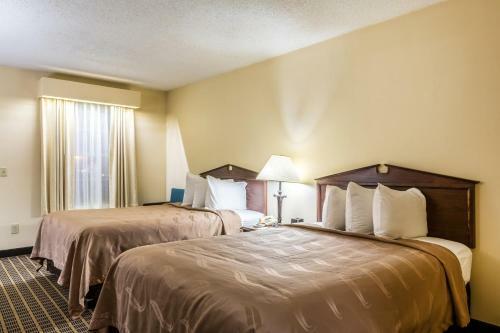 The hotel is right at I-20 about two miles south of downtown Greensboro and within a two-minute walk of at least three convenient fast-food restaurants. This part of Georgia is all about fishing and boating on Lake Oconee; the Port Armor Marina on the lake is about seven miles away. Twenty miles west on I-20 is Madison which is full of antebellum homes and has a quaint downtown of eateries and antiques shops. Atlanta International Airport is 77 miles away. 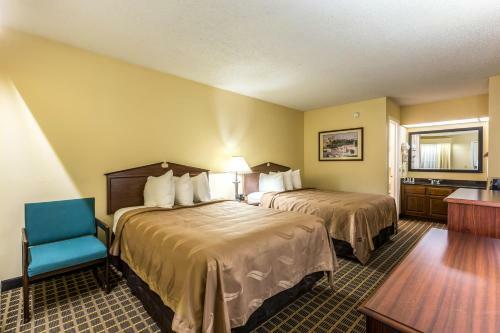 Add Quality Inn & Suites Greensboro to your free online travel itinerary.